Follow the links for CPD’s reports, papers and publications and other coverage of CPD’s work and that of our fellows. 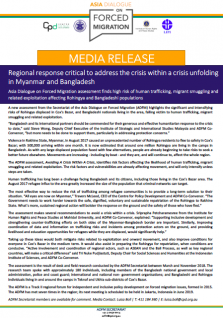 A new assessment from the Secretariat of the Asia Dialogue on Forced Migration (ADFM) highlights the significant and intensifying risks of Rohingya displaced in Cox’s Bazar, and Bangladeshi nationals living in the area, falling victim to human trafficking, migrant smuggling and related exploitation. 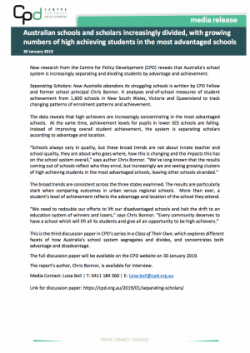 New research from the Centre for Policy Development (CPD) reveals that Australia’s school system is increasingly separating and dividing students by advantage and achievement. 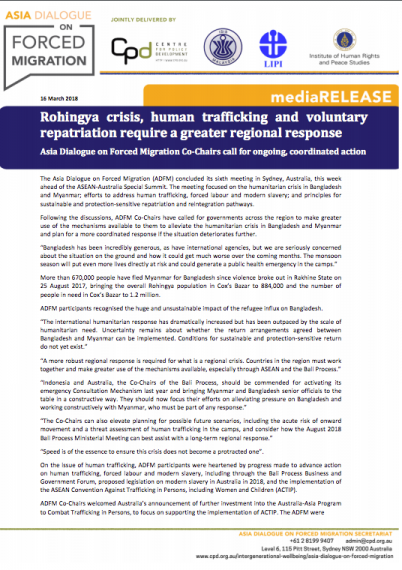 Following the seventh meeting of the Asia Dialogue on Forced Migration (ADFM) in Bangkok, Thailand, last month, ADFM Co-Conveners have called on states to take more coordinated and sustained regional action to support the Rohingya population displaced in Bangladesh and Myanmar, and to find alternatives to child detention. 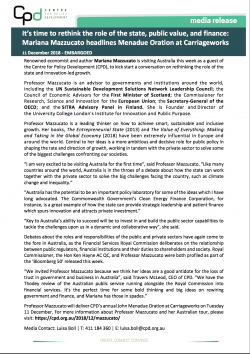 Renowned economist and author Mariana Mazzucato is visiting Australia this week as a guest of the Centre for Policy Development (CPD), to kick-start a conversation on rethinking the role of the state and innovation-led growth. Companies still lagging on modelling and disclosing impacts of climate change – more business, government and regulatory action is required. The Asia Dialogue on Forced Migration (ADFM) concluded its sixth meeting in Sydney, Australia, this week ahead of the ASEAN-Australia Special Summit. The meeting focused on the humanitarian crisis in Bangladesh and Myanmar; efforts to address human trafficking, forced labour and modern slavery; and principles for sustainable and protection-sensitive repatriation and reintegration pathways. 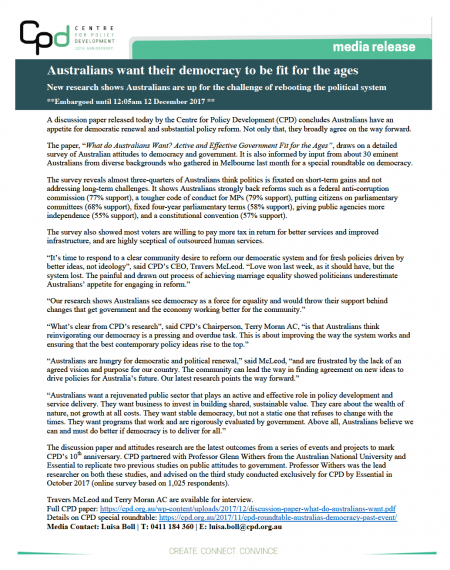 A discussion paper released today by the Centre for Policy Development (CPD) concludes Australians have an appetite for democratic renewal and substantial policy reform. Not only that, they broadly agree on the way forward. The paper, “What do Australians Want? Active and Effective Government Fit for the Ages”, draws on a detailed survey of Australian attitudes to democracy and government. It is also informed by input from about 30 eminent Australians from diverse backgrounds who gathered in Melbourne last month for a special roundtable on democracy. 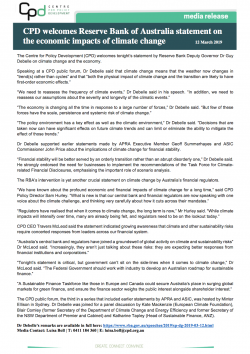 Rigorous planning for the financial and economic impacts of climate change is vital in Australia, where climate risks are profound and climate policy is behind the curve. Climate scenario analysis is the subject of a new discussion paper called Climate horizons: next steps for scenario analysis in Australia, released today by the Centre for Policy Development (CPD). It comes four months after the Financial Stability Board’s Taskforce on Climate-related Financial Disclosures (TCFD) recommended scenario analysis be used by companies to model the impact of different assumptions about climate change and climate policy on their business. Australia’s education system is riven with inequity and disadvantage due to a failed funding model, argues a new report released by the Centre for Policy Development. Losing the Game: State of our schools in 2017, by CPD’s Education Fellows and former school principals Chris Bonnor and Bernie Shepherd, analyses My School website data to demonstrate major deficiencies in how we invest in schools. It follows their seminal 2016 CPD report Uneven Playing Field: The State of Australia’s schools. 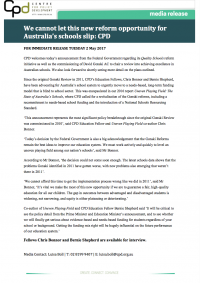 CPD welcomes today’s announcement from the Federal Government regarding its Quality Schools reform initiative as well as the commissioning of David Gonski AC to chair a review into achieving excellence in Australian schools. We also look forward to shortly seeing more detail on the plans outlined. improvements to the way the region responds to mass displacement of migrants. New legal opinion on directors’ duties and climate risks 31 October 2016 (read more here). Asia-Pacific region can galvanise the globe on migrants, refugees after New York Summits, Asia Dialogue on Forced Migration statement 21 September 2016. 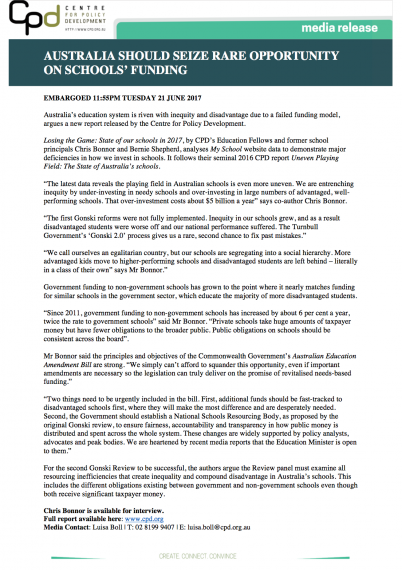 Australia’s school system is deteriorating in the absence of Gonski implementation: new CPD report 1 June 2016 (read the report here). 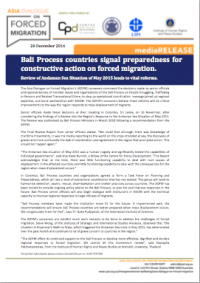 Bali Process steps up, but action on forced migration will be critical 23 March 2016. Terry Moran AC joins CPD as Chair 19 March 2016. White Paper puts climate change back on the table but fighting Australia’s longest conflict has barely begun 25 February 2016. New report finds Government is losing capability to help Australia’s most vulnerable 3 December 2015 (read the report here). Australia can shift from vicious to virtuous cycles in agriculture – new discussion paper 12 August 2015 (read the discussion paper here). Climate change is a national security threat to an underprepared Australia – new report 22 June 2015 (read the report here). CPD’s report on the IGR exposes the fanciful ‘national conversation’ about Australia’s deficit and long-term prospects 15 April 2015 (read the report here). Déjà vu: the loss of institutional memory in Canberra and implications for governance – panel discussion with Terry Moran, Laura Tingle and Fred Chaney – December 2016, Sydney. 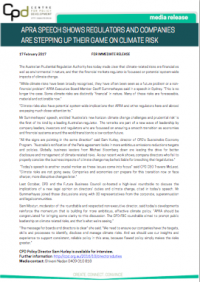 CPD-FBC Business Roundtable on Directors’ Duties, Climate Risk and Sustainability – October 2016, Melbourne. Responding to North Korea: in conversation with the Hon Michael Kirby and the Hon Gareth Evans – October 2016, Melbourne. Third Asia Dialogue on Forced Migration – September 2016, Kuala Lumpur. 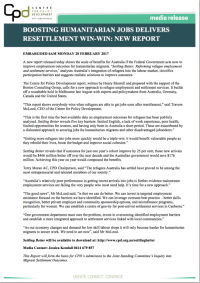 Cross-continental roundtable on settlement services for refugees – with the Centre for Public Impact – August 2016, Melbourne. The view from 2030: getting the budget right for the long term, roundtable with Peter Whiteford, Greg Smith and Janine Dixon – May 2016, Melbourne. Democracy and disillusionment in a digital era: roundtable series with Simon Lewis, change.org – February 2016, Sydney and Melbourne. 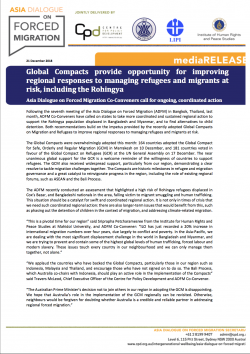 Second Asia Dialogue on Forced Migration – January 2016, Bangkok. 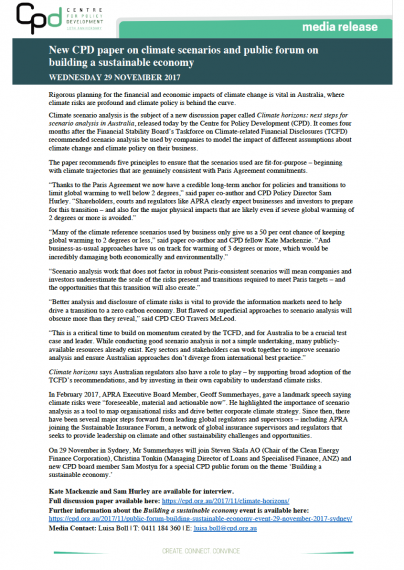 COP 21 and beyond: roundtable with Ross Garnaut, Robyn Eckersley and Fergus Green – October 2015, Melbourne. 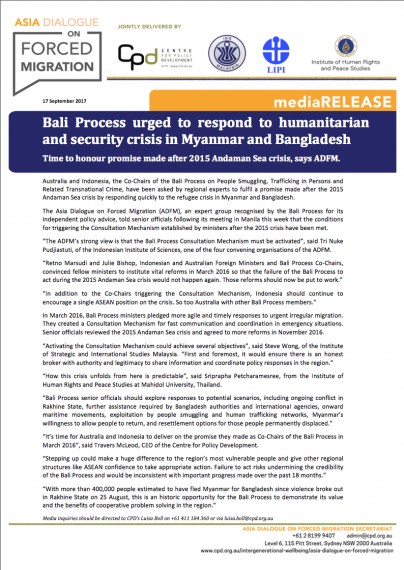 First Asia Dialogue on Forced Migration – August 2015, Melbourne. 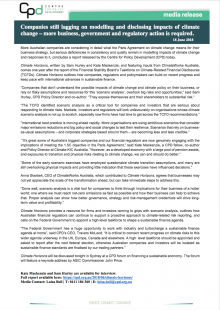 CPD-EY roundtable on agricultural sustainability – August 2015, Canberra. The longest conflict: launch and panel discussion with Neil Morrisetti and Chris Barrie – June 2015, Melbourne. High-level roundtable on government service delivery – March 2015, Melbourne. For research, insights and opinions from CPD’s fellows, click here.